Just 28 years old, chef Jordan Kahn has built the sort of résumé that others take another decade or so to cobble together. After helping launch Thomas Keller’s New York restaurant, Per Se, he did a stint making desserts at cerebral showman Grant Achatz’s restaurant Alinea in Chicago before eventually landing in L.A. to head the pastry department at Michael Mina’s XIV. That Sunset Boulevard venture went on to become a sensible (and good) steak house before closing in August, but when it started, XIV was damn-the-torpedoes ambitious. Owner Sam Nazarian wants things no other way. Kahn tried to deliver the final note to already jarringly dissonant meals with such offerings as jasmine ice cream crowned with cashew shortbread and paired with brandied bananas. Presented on supersize plates, his swooping, curling fantasies seemed to be rubbing up against the boundaries of the pastry discipline. I didn’t predict he would shift from desserts and open a restaurant as a chef, but I wasn’t surprised when I heard he had, either. ¶ Kahn’s restaurant, Red Medicine, which he co-owns with Mina alum Noah Ellis and Umami Burger founder Adam Fleischman, sits in an art deco building at Wilshire and Gale. The winking O in the red neon COCKTAILS sign in the front window telegraphs the casual interior, where people crowd an industrial but finished space—wood and polished-concrete floors, metal-framed tables with rough-hewn planks, gray-washed walls—enjoying fastidiously presented Vietnamese-inspired dishes. Kahn isn’t Vietnamese, and he hasn’t been to Vietnam, but he is cooking at a level to dispel any misgivings about whether his version of the food is neo, ersatz, or authentic. He uses lime, herbs, peanuts, and a battery of sauces in ways both modern and traditional. A liquid lime gel injects vibrancy to crackling spring rolls; a splash of nuoc cham, with its traces of chili, sweetness, and salt, makes a green papaya salad with fried taro and pickled roots light up your brain. A Savannah native who was raised on his Cuban grandmother’s black beans and ropa vieja, a beef stew, Kahn seems too self-aware to pretend he can fashion this food with the naturalness of someone who’s been steeped in it his entire life. But by digging down to its essence, Kahn reaches a genuineness that would not be possible by simply memorizing and mimicking the gestures of a Vietnamese cook. Of course, what a lot of people remember about Red Medicine’s opening last December isn’t the food; it’s the hubbub Kahn generated when his colleagues kicked out S. Irene Virbila, the Los Angeles Times restaurant critic, shoving a camera in her face and posting the image on their Web site. Apparently somebody from the restaurant didn’t appreciate her criticism of Kahn’s desserts at XIV, but the reaction seemed more thuggish than roguishly independent. (I can tell you a better way to lance a critic’s self-esteem far more coldly than booting us or blowing the anonymity we try to maintain: Pretend you’ve never read us. The reasoned reflection, those agonized-over adjectives, all that sublime opinion—for naught.) So I steered clear. To criticize would have appeared to be payback, and I sure didn’t want to have to praise the inhospitable. These many months later, however, it’s impossible not to praise Red Medicine. Though plates can take an inordinate amount of time to arrive, Kahn is working at something unique, approaching a great culinary tradition obliquely without surrendering the values at its core. Of all the elements of Vietnamese cooking Kahn has gravitated to, his taste for herbs gives him the most assured point of entry. Fresh, raw herbs are integral to the cuisine—brightening, counterbalancing, adding bite. That thicket of basil and mint leaves beside a bowl of pho isn’t optional; it is as much a part of the broth as the beef. A bánh mì without cilantro and pickled carrots and jalapeño peppers isn’t a bánh mì; it’s a sub sandwich. Grilled shrimp paste on sugarcane stalks wouldn’t be half as spectacular if it lacked pickled horseradish and leeks and the wrapping of lettuce. Kahn gets this. He can be seen in the open kitchen with his dark, scraggly beard as he plucks at planters of wild celery. 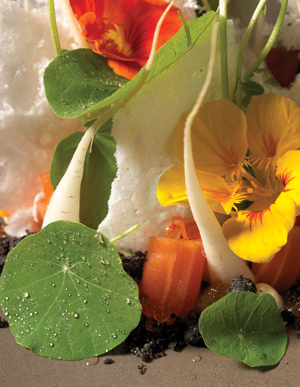 During his time off, he and his crew forage in the deeper glades of local mountains, tweeting things like “Jackpot, wild baby fennel.” He is Thoreau in 140 characters; his cooking reminds us how the flavors of herbs can push far beyond the parsley and Italian basil that sometimes seem like afterthoughts and into the realm of the grassy or spicy or even rich. Redolent of clove, the tub of pork rillettes is freighted with morsels of crunchy chicken skin, pistachios, and juicy lychee segments, but it is the herbs—some wild, others domestic—that contribute the pleasantly bitter element on which the rillettes depend. Kahn’s leap from pastry may have been preordained, but you still see aspects of his training in the minute handwork that goes into dishes. For the ocean trout small plate he lays out slivers of cured fish with lapidary exactitude, infusing the flesh with a deep-colored chili streusel and layering in verbena meringue for a contrasting grace note. Strands of tofu skin lend the artichoke en barigoule—a Provençal classic made with white wine broth—an unexpected creaminess, while thick ribbons of green mango provide zing; draped just so over the whole is a charred baby green onion. Kahn decorates his heirloom congee, or rice porridge, with pinches of hazelnuts, fried garlic, and roasted black malt that are so carefully arranged, they look like regiments in formation. When mixed into the moist rice that the kitchen has prepared with vermouth and chicken stock and finished with Echiré butter, the dish loses the formality such precision imparts and becomes completely satisfying. One night after a young woman nearby spooned it out for a table of friends, you could almost hear them purring. A highly analytical chef, Kahn takes a single ingredient and studies how it interacts with other variables. The lime-laced mayonnaise that accompanies the cross-cut spring rolls—their blistered skin bulging with Dungeness crab and pea pods—sparkles with freshness. Nuoc leo, a peanut sauce, plays off the more concentrated flavor of the dried peanuts that come with the chestnut-laden beef tartare, which you heap onto crackers made in-house with tapioca. For the roasted brassicas he pan-sears savoy cabbages, accenting the strips with chopped dates and Chinese sausage rendered to a crisp, then deglazes them with fish sauce. The fabulous combination—salty and sweet, smoky and complex—had me feverishly working my chopsticks to clean out my bowl. The inherent risk in being analytical is that you can overthink matters. Kahn’s seared squid gets lost in a web of associations, with the accompanying carrots rolled in fermented beans hinting at something Chinese and a bland onion soubise pointing to Vietnam’s French colonial era. (Fortunately Kahn keeps the Indochine references to a minimum: There was a time when, outside of the pho joints in Reseda and Little Saigon, the only Vietnamese you could get was the contrived sort Le Colonial served on Beverly.) I’m not sure what the pile of toasted barley and wild rice alongside a seared duck breast is trying to evoke, but my best guess is gravel. The toasted oats served with the bitter chocolate dessert—dehydrated cubes of chocolate mousse with soy milk sorbet—suffers the same effect. What the blob of parsnip puree is doing in the mix escapes me. Maybe Kahn is attempting a nod to authentic Vietnamese desserts, which tend to be far more virtuous than Western ones, incorporating the likes of red beans or taro or kernels of corn. But he needn’t try so hard. The earthiness he aims for comes through much more clearly in the best dessert, a tumbler layered with basil leaves, chicory streusel, peanut croquant, coconut bavarois, and condensed milk in a finely calibrated homage to Vietnamese iced coffee. Direct and subtly rich, it goes remarkably well with the Dönnhoff Auslese, a German wine of languid sweetness. The Riesling-dominated wine list is the most serious effort in the city to engage with Asian food; the varietal’s floral delicacy and backbone of slate tame without denaturing a fiery palette. That said, there’s a penalty for not choosing this grape. The pinot noir selection is, with a few exceptions, a collection of trophy burgundies, and only one out of seven chardonnays is below $70. A lone Rhône-style wine, the Parr Selection Santa Ynez Valley syrah, costs $64. The Rieslings here not only start out more fairly priced (a J.J. Prüm Kabinett is $45), but they are able to match Kahn’s cooking, nuance for nuance. Noah Ellis serves as manager and sommelier, and one night he suggested a $60 Tatomer “Kick-on Ranch” Riesling from Santa Barbara County to go with my casserole of Santa Barbara prawns, which had been cooked over hot stones and various spices. Filled with rocks, the Le Creuset pot was so hot, a napkin had to be placed underneath to keep it from scorching the table. The presentation reminded me of kho, the Vietnamese tradition of clay pot cooking, but it was very much Kahn’s own sidelong creation. He’s not attempting to dumb down Vietnamese food; he pays his respects to the canon without trying to reinvent it or, for that matter, adhere to it. The effect can be transporting. When the Le Creuset lid was lifted, a heady vapor of anise, cinnamon bark, and lemongrass billowed up, capturing a latitude with scent alone. Hours: Nightly, 6 p.m.-2 a.m.